But what exactly is in all the food we eat? Every time you walk into a grocery store and see something packaged in a cardboard box, a plastic container or a glass jar you are being exposed to labels which have certain Food Claims. As a consumer, it’s our job to be aware of the ever-changing food environment we are faced with in order to make informed decisions about the food we consume on a daily basis. So what exactly is a Food Claim? There are three categories that can be placed on food items. A nutrient content claim, referring to the amount of nutrients within the food. A health claim suggests a correlation between a food and a health-related condition. I’ve picked three of the most asked about food claims to explain below. Organic – According to the United States Department of Agriculture (USDA), the claim “organic” may be displayed on any product that contains a minimum of 95 percent organic ingredients. Up to 5 percent of the ingredients may be non-organic products. However, keep in mind, from a caloric or nutrient point of view, a food item being labeled as “organic” does not mean it has less calories or more nutrients that other “non-organic” products. Free – the term free is added to many packaged food items in order for consumers to perceive the food lacks a negative quality. This term used most with “Sugar-Free” food items. A product can claim to be “Sugar-Free” if it has less than 0.5 grams of sugar per serving. Keep in mind, this does not mean the food item is carbohydrate free. 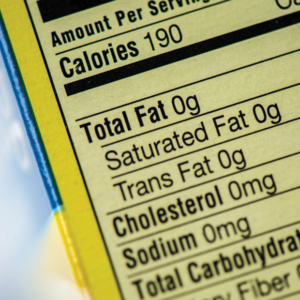 If you are watching your carbohydrates intake at meal times, you still want to read the food label and see the Total Carbohydrate listed on the package. Healthy – this term can lead so many down the wrong path. In fact, the FDA is currently re-evaluating its definition due to industry concerns relating to fat content of foods. In order to be labeled “healthy” a food item must be low in fat, total fat, saturated fat and cholesterol. It must also contain other nutrients, such as at least 10 percent of daily value of vitamins like A, C or iron and protein. A full appendix is provided on the FDA’s website. Bottom line is knowing, understanding and applying food claims is complicated. Eating whole food items is your best bet. I personally try to use the 80 to 20 rule. 80 percent real, whole, unprocessed food items and 20 percent pre-made, pre-packaged, processed food items. When it comes to living a healthy lifestyle ALL food fits, but portion control and regular movement are key.